This distinguished fellow had a long and hard-working career in the mural business, but he's semi-retired now. He spends most of his days now in the studio, doing odd jobs like priming panels and canvases. Our materials do take on a personna, don't they? We embue them with our spirit, I think and then it is hard to really let them fully retire! I see you haven't allowed 'him' to do that! you caught his years of dedicated service/charm..i love it! It's true, Lynne. I have a special attachment to brushes. I have hundreds of them, some worn to nubbins...I can't throw them away! HA--I like that idea, Mike. I could see a series on the theme of the old brush home--couldn't you? Thanks for the visit. He's still a handsome brush for all the work he's done. I love the color you've chosen for a background, that's always something I have problems with. 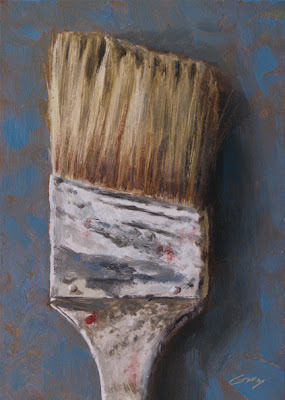 Brushes like these are what I look for when I go to flea markets and garage sales. Obviously cared for and of great quality. Welcome, Lydia, and thanks. I checked out your blog--you're doing some interesting work. Good luck with your painting.